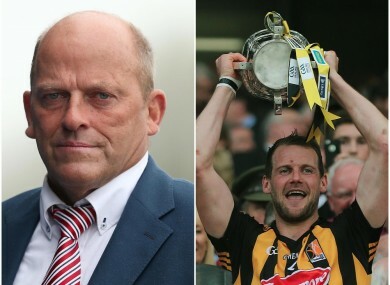 RTÉ pundit Ger Loughnane and Kilkenny hurler Jackie Tyrrell. WHATEVER SENSE OF concern there may have been over Kilkenny’s 2016 hurling prospects, was firmly dispelled in Portlaoise last Saturday night. They swatted Dublin aside by 12 points to canter into a Leinster final and helped the memories of the four-goal concession against Clare in April fade. Kilkenny now stand just three victories away from an All-Ireland three-in-a-row. Not bad for a team described as ‘functional’ by Clare legend Ger Loughnane back in April, with Loughnane also asserting that there was ‘no way’ that this bunch of Cats should be on the brink of a third successive Liam MacCarthy Cup triumph. “Ah sure, I don’t know really what to make of it,” smiled Jackie Tyrrell, speaking yesterday at a GAA-GPA Avonmore Protein launch in Croke Park. “I think these auld lads, and I see it with Fan Larkin in our club, ‘ye weren’t as good as in our day’ and ‘there were no hamstrings in my day’ and all this kind of craic. “I think they have that kind of mentality about them and maybe Ger is alluding to that a bit. “The ‘functional’ comments, it doesn’t really make sense to me. Does it bother me? It doesn’t bother me in the slightest. “I actually rate Ger, I think he’s a good analyst but to say we’re functional. I don’t see how. “If you see the success that we’ve had and the players that have played and the players that are still playing. Would more silverware this season endorse the excellence of this Kilkenny side? “Yeah, I suppose it would,” stated Tyrrell. Tyrrell does not subscribe to the theory that the comments will provide more motivation for Kilkenny in 2016. “I don’t really buy into that. We don’t look at what this lad said or what that lad said, it hasn’t been referenced in our dressing-room and I can’t see it being referenced. Email “'I actually rate Ger, I think he's a good analyst but to say we're functional. I don't see how.'”. Feedback on “'I actually rate Ger, I think he's a good analyst but to say we're functional. I don't see how. '”.